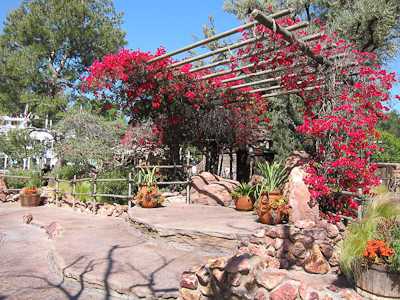 Kevin’s favorite restaurant in the park is the Rancho del Zocalo Restaurante. Because it’s more than just a restaurant. It’s a Restaurante! Ole! Anyway, good Mexican food. Good atmosphere. 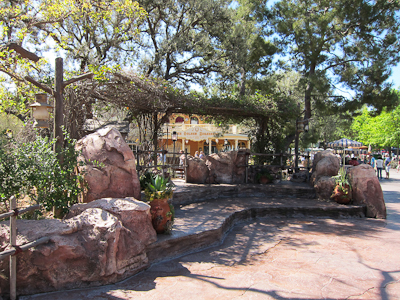 And conveniently located in Frontierland right by Big Thunder Mountain Railroad. But also back here is a nice little shady spot to rest. I love finding these little nooks and crannies through the power of MYWTM. How does that sound? The power of MYWTM? My blog is a SUPERHERO, Y’ALL! Sometimes you’ll see entertainment or even a surprise character here, but most of the time it’s just a nice place to kick back and take a load off. 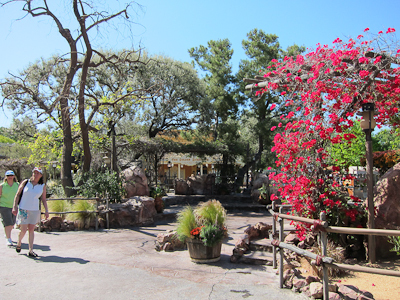 And also near this area is the Big Thunder Mountain Fastpass machines. And here’s a hint. Right now the Big Thunder Mountain Fastpass is disconnected from the network, which means that you can hold a Big Thunder Fastpass along with two other Fastpasses. It doesn’t count against you–you can hold it as long as you want. Same goes for Roger Rabbit’s Cartoon Spin, also disconnected. Subject to change, of course. The Fastpass machine is so cute! 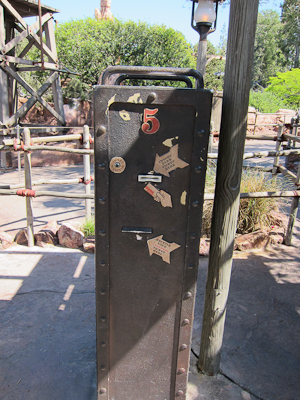 With big arrows showing you where to put in your park ticket or annual pass in order to get your Fastpass. There’s also a water fountain in this area too, if you’re like me and you take a drink every time you see one. 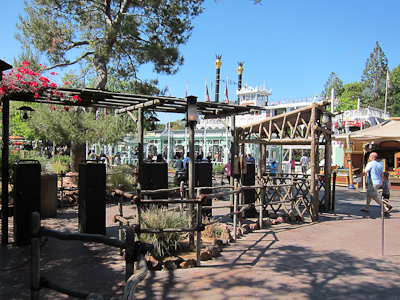 So a nice little area to kick back, maybe check out if there’s something going on, and pick up your Fastpass! Good veggie options here, too. This is my favorite lunch spot in the park. GREAT post, Shelby! All the food I’ve had here is good, and the prices feel more reasonable than some other restaurants in the park. Plus they have root beer. I’ve always wanted to eat there! But Audrey isn’t of “restaurant age” yet. Another mno soon?! It’s quick service, just get your food on a tray and eat it. MNO yes!